“The NBA is a copycat league ... but I don’t spend a lot of time analyzing other teams.” Therein lies the individuality that let Daryl Morey (McCormick ’96) rise to the top. If there were an all-star team for general managers, Morey would be on it year after year. As general manager for the Houston Rockets (33-12) since 2007, Morey was one of the pioneers and primary proponents of an evolving basketball philosophy, sometimes dubbed “Moreyball,” reliant on analytics to guide executive and on-court decisions. In a CTSS event last Wednesday, Morey reflected on the role his extensive studies of computer science and statistics at Northwestern has played in developing a framework for his management style. However, NBN Sports knows that even the best-of-the-best are malleable; we know that what makes them great doesn’t make them invincible. After all, Michael Jordan got cut from his high school varsity team, Tom Brady was not picked until the sixth round of the NFL draft and Jose Altuve won this year’s AL MVP despite going undrafted because at 5-foot-6, he was deemed too short. In the words of the great Bruce Lee, “The intangible represents the real power of the universe.” That’s why we asked Morey about what sports analytics can’t tell you. Morey elaborated further at the event, adding that no matter how many numbers and metrics are available, young players are incredibly difficult to predict. 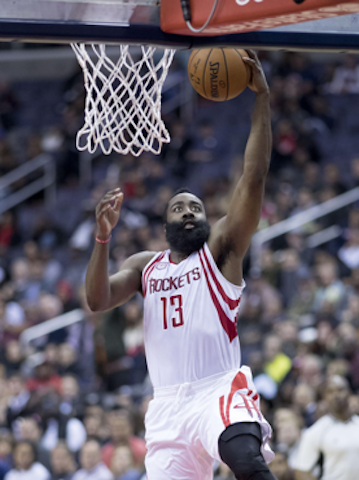 The Rockets invested significant time and money into several young players who didn’t pan out – notably Royce White and Terrence Jones – before striking gold when in 2012 they traded for James Harden in, a perennial all-star who finished second in MVP voting last year. Photo courtesy of Creative Commons, Keith Allison from Hanover, MD, USA. Morey also said there are players who are far more valuable than computer systems would make you think. “A guy we had for years, Chuck Hayes, is someone that’s really important to the team in a way that didn’t show up in a traditional way,” Morey said. Despite being hindered by injuries throughout his time on the Rockets, Hayes was always highly praised by his coaches. He rarely had the ball in his hand, but he set a lot of screens, served as an offensive decoy and was a dominant post defender on multiple Rockets teams that notched over 50 wins. Morey believes that there is no one formula to win, and therefore teams should focus on what works best for them based on their players and coaches. Whatever Morey does to balance an analytical and traditional approach has worked. The Rockets have not had a losing season since he took over, and have finished first or second in the ultra-competitive Western Conference four times. Moreyball has taken the league by force, but he realizes that understanding its limitations are just as important as exploiting its benefits as he searches for his first NBA championship.